4: Remembering Walter Smith (latterly known as John W Smith and father of the conductor) who rang his first peal here at Wickwar, on the 4th bell, on the 12th October 1937, exactly 80 years ago. 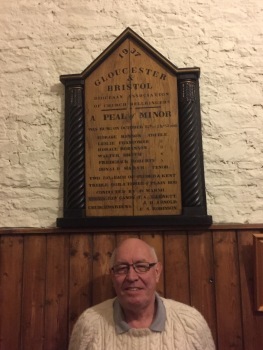 D Paul Smith, tonight's conductor proudly standing in front of the Peal board commemorating his fathers First Peal on the 12th October 1937, exactly 80 years ago. Last updated Thursday, 12 October 2017 at 22:14:24. First submitted Thursday, 12 October 2017 at 21:57:11 by Rachel M Parker. Sent for publication in The Ringing World on Thursday, 12 October 2017 at 22:28:47. This performance has been viewed 626 times.